In the recent healthcare debate, Mr. Wendell Potter has gained prominence as an outspoken advocate for truly meaningful reform to the existing system, quite unlike some of the recent protests which are backed (financially and otherwise) by lobbyists for the healthcare "industry". The reason for Mr. Potter's recent celebrity: he's an industry "insider" and can testify just what the for-profit healthcare industry does in pursuit of profits, and the picture he has painted isn't quite as innocent as proponents, many of whom are protesting at town hall meetings across the country right now, would like us to believe. Wendell Potter held variety of positions at CIGNA Corporation for over 15 years, most recently having served as that company's head of corporate communications with a role of acting as the healthcare insurance company's chief corporate spokesman. Prior to joining CIGNA, Mr. Potter also ran communications at Humana Inc. (another large for-profit healthcare insurer). However, after a 20-year career as a corporate PR executive for the healthcare industry, last year, Mr. Potter left his job as head of communications for CIGNA to assist "socially-responsible" organizations -- including those advocating for meaningful health care reform -- achieve their goals. Since May 2009, Mr. Potter has worked for the Center for Media and Democracy's (CMD) Senior Fellow on Healthcare. CMD was founded in 1993 as an independent, non-profit, non-partisan, public interest organization. CMD's mission is to promote transparency and an informed debate by exposing corporate spin and government propaganda and by engaging the public in collaborative, fair and accurate reporting. 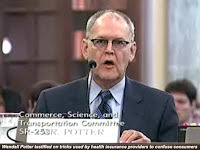 Potter has since testified before Congress (before the U.S. Senate Committee on Commerce, Science and Transportation) and appeared in several television interviews. Most notably, on July 10, 2009, Potter was interviewed by Bill Moyers on PBS, and in that interview, he disclosed exactly how the for-profit healthcare industry put profits before patients, sharing some of the sleazier tactics used to drop patients when they are diagnosed with various illnesses, etc. -- including the industry's efforts to discredit Michael Moore's SiCKO movie!! It's pretty shocking! Corporate Control of the Healthcare "Debate"? Of course, in recent days, what has made the news on America's corporate-controlled (from the likes of Viacom, Time-Warner, Disney, GE, News Corp. and others who dominate much of the U.S. media today) news outlets? Personally, I don't have an issue with protests even, but I do have an issue with organizations that are purposely and covertly misrepresenting themselves with a goal of stopping the discussion about reform altogether and presenting it as "news", which our media seem only too willing to suggest actually IS news. Also, be sure to catch my previous posting on healthcare reform, or rather the lack thereof, here. What does anyone in the Diabetes O.C. have to say about this? Aren't we as a country entitled to a legitimate discussion? What about the media's role here? The Los Angeles Times' blog is now reporting that supporters of the Obama healthcare reform proposal are now so outnumbered by paid opposition that they too are now recruiting paid supporters on Craigslist. My only response is that if the opposition is going that route, then supporters really have no other alternative unless they're willing to be steamrolled. Unfortunately, this drags the entire discussion into the gutter (literally) and denies Americans a fair and honest discussion about real healthcare reform! I saw that Bill Moyers interview when it aired. I stayed up until 4am to write a post. I was so disgusted. Dialogue is key. There Must be discussions. As to how, where, who....I don't know anymore. There is such hatred going around that it is clouding judgment. Too many people "rely" on the media instead of doing their own investigating. Instead of asking the questions themselves. 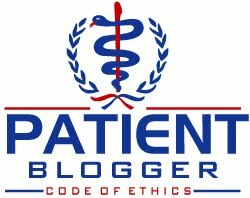 Patients must advocate for themselves, it's the best way to care for yourself. Unless you read the fine print, make phone calls, ask questions and then more questions -- well it just gets "accepted" that what you see is what you get, this is how it is. I don't know Scott. I still cannot think, let alone write, coherently on this subject. It frustrates me to no end. I should just move to Toronto. I would say we are entitled to discussion, and hopefully a voice in how we use our own money (and our own money alone) to maintain and improve our health. Sadly, the shenanigans in DC -- congressmen urged to put through complex, change-laden legislation without even being able to glance at (much less read and understand) the legislation they are being asked to pass -- has made most people of conscience more than wary of The System. I have no issue with for-profit insurers making profit at the expense of individuals -- profit is, after all, their raison d'être. Regulations restrict both our ability to profit health-wise and their ability to profit financially. A number of novel constructs are being designed and adopted by individual patients and practitioners to deal with these issues -- constructs created and sustained by the free market, allowing the normal market forces of cost sensitivity to keep provider prices at a more reasonable level. I would prefer government to remove itself completely from the equation (including its cost-inefficient, patient-insensitive programs such as Medicaid and Medicare) and let the market sort itself out. In doing so, we will find greater innovation and greater incentives to care. "Using Shift work for white collar jobs to greatly reduce the fiscal and environmental cost of new office space"
When you need to fake grass roots participation in town hall meetings and press conferences rent human look a likes from Astro Turf Fighters Robotic Rentals. We the people, depsite some of the idioits we have collectively elected, are not as stupid as the politicians would like us to be.